What is Fixed Assets CS? Fixed Assets CS by Thomson Reuter is a fixed asset management and depreciation accounting platform that has specialized software solutions for accounting, legal, and professional organizations. The comprehensive system is designed to make asset and depreciation management easier as it is flexible, fully customizable, and easy to use even for those with limited technical expertise. As a module in the CS Professional Suite, Fixed Assets CS shares data with the other suite applications in order to save time, while still ensuring accuracy. Assets gathered throughout long periods of time can still be retrieved. Users do not need to estimate expenses with the help of interim depreciation journal entries that can be imported right into Accounting CS. 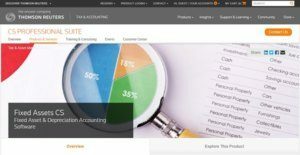 Fixed Assets CS shares data with Accounting CS and UltraTax CS programs of Thomson Reuters, thus making asset information readily available, no matter what program you’re in. The powerful inventory control software simplifies the process of adding, changing and disposing assets with a logical file folder format, intuitive interface and customizable asset tracking and sorting options. The application is designed to present only the needed data entry options, in order to avoid errors and maintain focus. It can calculate an unlimited amount of treatments and handle virtually any asset management situation. One can automate asset tracking by choosing from a number of built-in, easy-to-use wizards. These include disposal, method or life and association wizards that can walk through each key asset management step. Fixed Assets CS has a library of standard integrated reports that can be easily customized to suit specialized business needs. Users may also build a set of customized reports for individual clients. As an offering in the CS Professional Suite, Fixed Assets CS shares data with the other suite applications to help streamline procedures and accomplish more tasks. One can also easily import and export data directly from ASCII files and Microsoft Excel to lessen tedious manual inputting, but without compromising data accuracy. If you are considering Fixed Assets CS it might also be sensible to examine other subcategories of Best Fixed Asset Management Software collected in our database of B2B software reviews. It's important to note that virtually no service in the Fixed Asset Management Software category will be an ideal solution able to meet all the goals of various business types, sizes and industries. It may be a good idea to read a few Fixed Assets CS reviews first as specific software might perform well exclusively in a really narrow set of applications or be prepared with a really specific type of industry in mind. Others can work with an idea of being easy and intuitive and as a result lack advanced elements welcomed by more experienced users. There are also software that support a large group of customers and provide a complex feature base, but this in most cases comes at a more expensive cost of such a software. Make sure you're aware of your requirements so that you purchase a solution that has specifically the elements you look for. How Much Does Fixed Assets CS Cost? We realize that when you make a decision to buy Fixed Asset Management Software it’s important not only to see how experts evaluate it in their reviews, but also to find out if the real people and companies that buy it are actually satisfied with the product. That’s why we’ve created our behavior-based Customer Satisfaction Algorithm™ that gathers customer reviews, comments and Fixed Assets CS reviews across a wide range of social media sites. The data is then presented in an easy to digest form showing how many people had positive and negative experience with Fixed Assets CS. With that information at hand you should be equipped to make an informed buying decision that you won’t regret. Fixed Assets CS	vs. AssetWorx! What are Fixed Assets CS pricing details? What integrations are available for Fixed Assets CS? If you need more information about Fixed Assets CS or you simply have a question let us know what you need and we’ll forward your request directly to the vendor.